I think this may be one of my favorite style boards so far, with these two being a close second and third. Black and white paired with a pop of red is such a classic look. I thought this necklace with this biker jacket was the perfect combination, too. (Biker Jacket + Babe Necklace = Biker Babe). Red is one of my favorite colors to throw into an outfit to make it pop! This might be one of my favorite boards as well! Oh I like that you put the prices next to things, and as always you have the best collages! I need a moto jacket..although not sure how useful it would be here in Cali. haha. I love the red with the leather jacket! That leather jacket is GORGEOUS btw! I love your collages, I need to do more of these. Gah! You find the best pieces! Love that bag, the ring stack and both sets of shoes! Not to mention the sweater blouse jacket jeans....so yeah. Everything! Great set, Lisa! Great choice. Black and white with the touch of color given by this sweater. Love everything on this post! Love that bag!!! Absolutely LOVING that leather jacket, doll! I always love getting ideas from you about how to style things in different ways! Great looks! I love the lace up pump. So pretty! Love that color and those black flares! Both of these looks are so pretty! Love that leather jacket! Hi Lisa! It's been a while. :) Hope you've been well! Love the coral with the black and white color scheme. I would've never thought of pairing those three colors together, so thank you for the idea! ;) Two great looks! I love both ways....that sweater is a great color! Love these picks!! 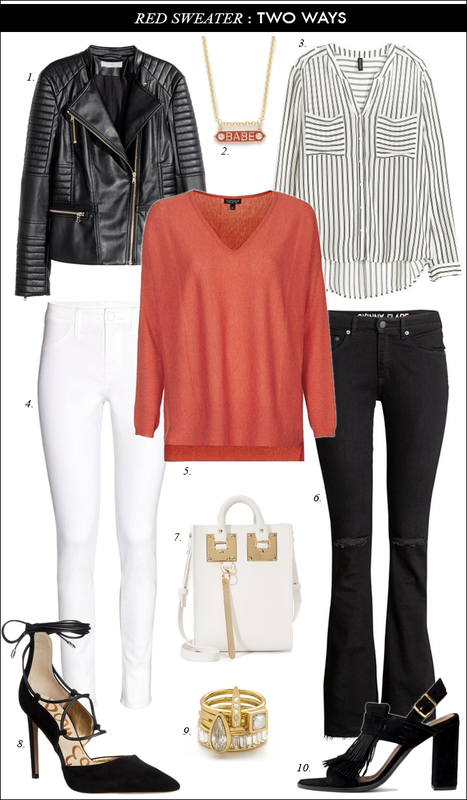 And I love the sweater with the stripes and white jeans! Love this board, the jacket looks amazing!